Our Amish made mini roll top desk is the perfect size for someone who doesn’t have a lot of space, yet still likes the styling of a roll top. 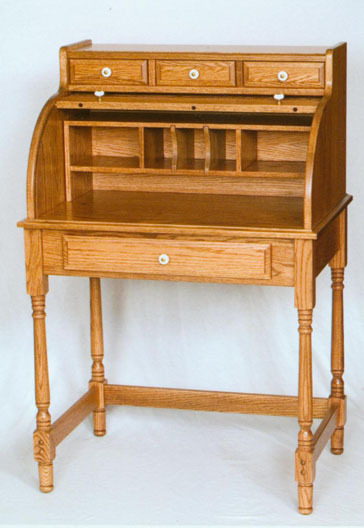 Made of solid oak by Amish craftsmen, our #62 mini roll top desk features sturdy dovetail drawers, pigeon holes and a classic roll top, all in a smaller size. The center drawer features full extension slides, and the pigeon hole inside section is removable and can be placed on top of the small drawer section for added inside space! You’re looking at a great choice for a student to do homework or for a comfortable spot to ease the pain of paying those monthly bills! Amish builder keeps inventory of unfinished desks allowing for shorter delivery times. Desks are stained to order and then shipped to us in only a few weeks.